Clutch blocks allow you to transfer rotational motion and torque among spinning components at different speeds and gear ratios. In general, a single set of gears is not sufficient to accomplish this transfer. Control the time, method, and quantity of transferred power by building high-fidelity custom clutch systems that connect clutches to multiple blocks from the Gears library. Determine how heat generation affects the efficiency and temperature of driveline components using thermal variants of clutch blocks. Learn basic terminology, understand how clutches function. Model a simple gear and clutch coupling. Bring a spinning driveline component to a controlled stop using a clutch. 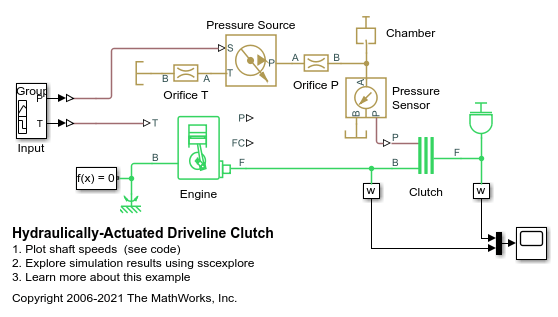 Learn how clutch-like elements can act as dynamic elements or conditional restraints. Learn how the Fundamental Friction Clutch block allows you to exert direct control over friction torques. Model viscous friction using subsystems that act at shaft bearings. Model smooth clutch pressure signals changes using neutral switches. Model a vehicle with and dual-clutch transmission system. Optimize simulation performance by adjusting Simscape™ Driveline™ and Simscape solver settings and model fidelity. The use of clutches to accelerate and decelerate a pair of shafts connected by a gearbox. The gear connects the output and intermediate shafts. The inertia for both of these shafts is included in the Inertia Output Shaft component. This pair of shafts is connected via one clutch to a drive shaft which is driven by a torque. These shafts are also connected via a second clutch to a stationary point. Two inertias coupled by a simple gear controlled by a clutch. Initially, the clutch pressure is zero, and the inertias have zero velocity. A constant torque is applied to Inertia 1. 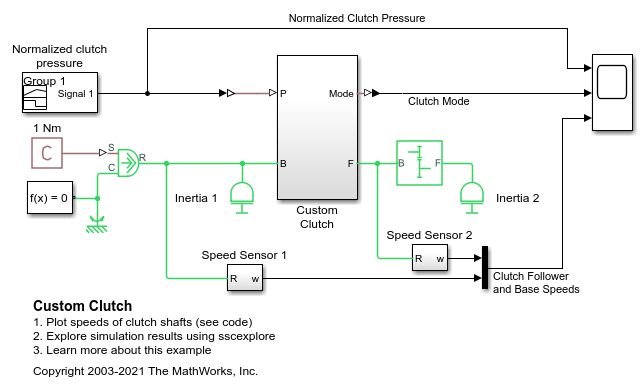 Once the clutch pressure starts increasing from zero at 2 seconds, Inertia 2 starts spinning, then locks with Inertia 1. From 6 to 7 seconds, the clutch pressure is ramped down to zero, and Inertia 2 starts to spin freely once the clutch unlocks. Because there is no frictional loss, it keeps spinning. 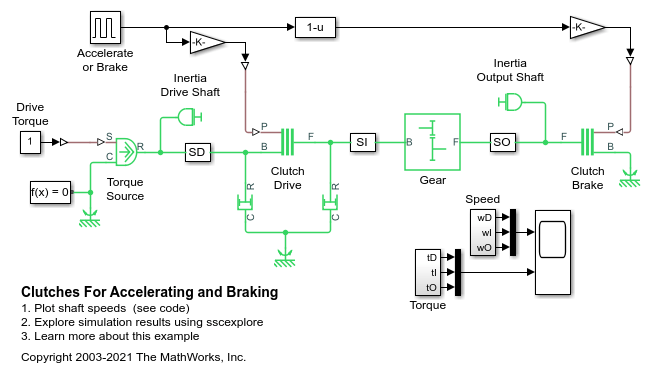 An engine driving an inertial load via a hydraulically-controlled clutch. It shows how Simscape™ Driveline™ can be used in conjunction with Foundation Library hydraulic blocks to model hydraulically-actuated drivelines.